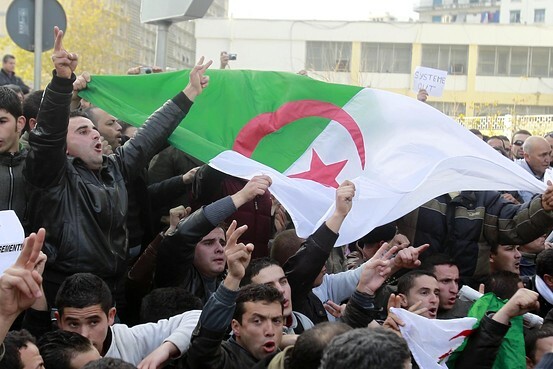 On the eve of the step down of Egyptian President Hosni Mubarak, thousands of Algerians take to the streets in protest. While they are not calling for the removal of Algerian President Abdelaziz Bouteflika, they are however chanting for reform. Thousands of people defied a government ban on demonstrations and poured into the Algerian capital for a pro-democracy rally Saturday, a day after weeks of mass protests toppled Egypt’s authoritarian leader. Some 10,000 people flooded into downtown Algiers, organizers estimated, where they skirmished with riot police attempting to block off streets and disperse the crowd. Some arrests were reported. Protesters chanted slogans including “No to the police state” and “Bouteflika out,” a reference to President Abdelaziz Bouteflika, who has been in power in this sprawling North African nation since 1999. Algerian protests first flared last month, inspired in part by the demonstrations taking place in next-door Tunisia. But in Algeria, anger over a sudden increase in food prices–enacted by the government as part of what it had billed as economic reforms–was also a big trigger. Since then, Algeria worked to reverse those hikes. In subsequent weeks, as revolts in Tunisia and Egypt inspired other Arab protesters to demand political reform, Algerian opposition leaders have made similar demands. Last week, Algerian authorities vowed to lift a state of emergency that’s been in place since 1992, one demand of political reformers. Opposition leaders have said they aren’t seeking the immediate overthrow of longtime President Abdelaziz Bouteflika.